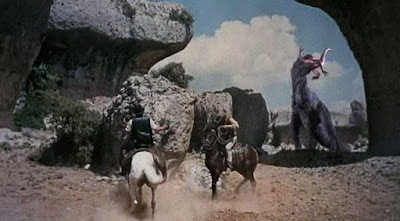 The Valley of Gwangi (1969) is a fantasy adventure from a bygone epoch of filmmaking, perhaps even one that might, today, be described as prehistoric. What that means, basically, is that the film’s dinosaurs (and elephants, at one point) are rendered via stop-motion animation. 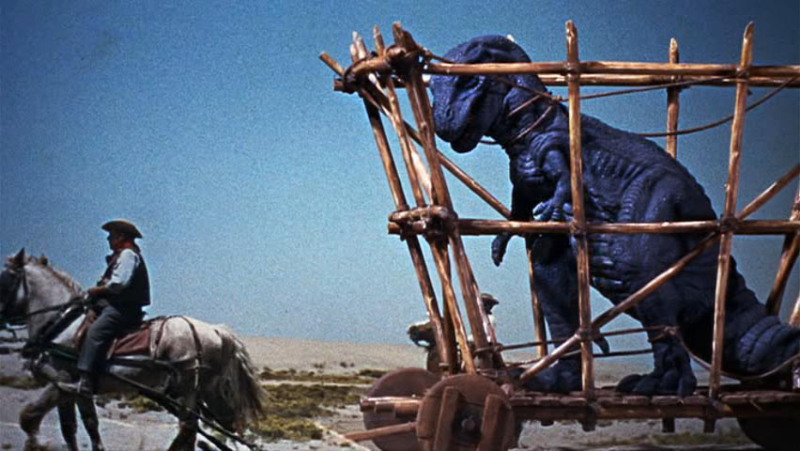 Like many of you, at least presumably, I grew up with the wondrous cinematic works of Ray Harryhausen, including The 7th Voyage of Sinbad (1958), Mysterious Island (1961), Jason and the Argonauts (1963), The Golden Voyage of Sinbad (1973), and Clash of the Titans (1981), to name just a handful. 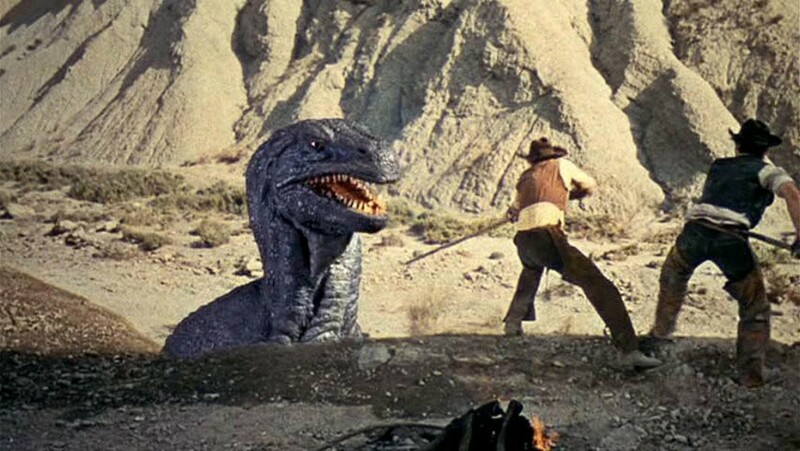 And when I was young, The Valley of Gwangi was on TV all the time. Or at least it seemed that way. I screened the film again for this review, in 2017, and came away with the uncomfortable feeling that in comparison to those other titles, The Valley of Gwangi is a bit lacking. The story is very derivative and familiar; essentially a retelling of King Kong (1933). And the human protagonists are not particularly appealing or likeable characters. On the contrary, they seemed designed to be cynical and flawed. This may have been an attempt to make the film play as more adult and realistic, but the result is that there is no central character -- no Sinbad, Captain Nemo, Jason or Perseus for example -- to serve as a focal point of audience identification. The visual effects, of course, are remarkable for their day and time, and wholly products of their 1969 context. One can (and should) admire the artistry that went into the creation of the film’s major set-pieces. And yet today, we don’t believe that dinosaurs moved the way they do here. Today, we see the flaws in the animation; namely that foregrounds are sharp and distinct and the backgrounds appear washed out and less distinct. 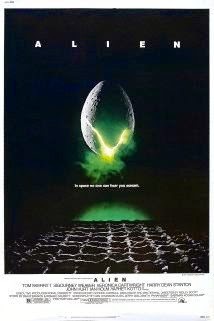 These facts established, at least one visual effects shot here is an undisputed masterpiece, and highly influential in terms of its execution. It’s always difficult to review the films of one’s youth, and assess that time may be starting to pass them by. Yet The Valley of Gwangi, despite its cult-status, seems a bit plodding and lacking thrills in 2017. At the turn of the century, in Mexico, a gypsy, Miguel, dies while bringing back a rare treasure from the Forbidden Valley: an eohippus, or miniature horse. An older gypsy woman (Freda Jackson) warns her son, Carlos (Gustavo Rojo) that the animal must be returned to the valley, lest a curse befall all of them. 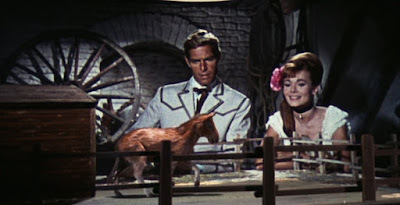 Elsewhere, a smooth-talking cowboy, Tuck Kirby (James Franciscus) visits an old flame, T.J. Breckinridge (Gila Golan) who is now starring in a cheap, poorly attended rodeo show in Mexico. They were once lovers, but Tuck has returned not to rekindle old flames, but to negotiate a fair price for T.J.’s show horse. When Carlos gives T.J. the eohippus, she realizes that she now possesses an attraction that will make her rich. Meanwhile, however, a paleontologist named Bromley (Laurence Naismith) wants to learn where the eohippus came from. He hires horse rustlers to steal the miniature horse and release it, so it will lead him to its home, to the Forbidden Valley. A party consisting of Bromley, Carlos, and eventually Tuck and T.J. follows the horse to the secret valley. There, they encounter a pterosaur, a Styracosaurus, and a hungry Allosaurus. When the Allosaur follows them out of the valley, they resolve to bring “Gwangi” back to civilization, making it an attraction at the wild west show. That decision, however, has unforeseen and disastrous consequences. It is not difficult to see how The Valley of Gwangi mimics very closely the basic outline of King Kong (1933). A group of adventurers (related to show-business) visit a secluded or remote area where prehistoric monsters dwell. Once there, they discover that one beast dominates the others (either Kong or Gwangi), and tussle with the beast. After some adventurers, the great beast is subdued (either by gas grenades or lasso), and returned to civilization. The differences between tales are intriguing, however, to consider. Kong is an attraction in New York City, on Broadway, basically. Gwangi is an attraction on the edge or outskirts of show-business, at an under-attended wild-west show. The result in both cases, however, is the death and destruction of that which was brought back from nature, from the wild. Something unique, in both situations, as a result of human selfishness or avarice. As I noted in my introduction, it is fair to state that the lead protagonists in most Harryhausen films, and in King Kong as well, are colorful and dynamic. In the case of most Harryhausen films, the central characters are figures of myth, or great literature. We identify and side with them because of the larger-than-life heroism of characters like Sinbad, or Perseus, or Jason. In Kong, we identify with the love story between Jack and Ann Darrow. And though Denham is exploitive, we also view him as a hero, as a man on the edge of a great new frontier. The Valley of Gwangi goes out of its way not to sentimentalize or mythologize the film’s heroes. On one hand, that’s a fascinating idea. On the other hand, it robs the film of a central point of identification. Tuck has returned to Mexico not to write a moral wrong (his treatment of T.J.) but to negotiate a transaction with her. T.J. realize she loves Tuck and wants to live with him on a ranch, when he suggests it…until she realizes she could make a ton of money exploiting the eohippus. And Professor Bromley, a man of science, hires people to steal the miniature horse, so it will lead him to the Forbidden Valley. In some way, they are all quite cynical, all quite flawed. Again, one might claim that this is merely a realistic rather than glamorous portrayal of mankind, and I won’t argue the point. However, by the same token, there’s nobody likeable or honorable in the picture, either, which makes it, to some degree, less compelling as a visceral experience. We’re less invested in the characters’ survival, because we don’t care deeply for them, or about them. Even Gwangi is less identifiable and relatable a figure than was Kong. Kong had flashes of emotions and feelings that we all recognize. Gwangi doesn’t elicit the same feelings. The Valley of Gwangi’s special effects earn respect and admiration, even though today we recognize them as not being quite photo-real. At least two sequences are still quite extraordinary: the battle with the Styracosaurus, and the scene in which Gwangi is lassoed and brought to the ground by the cowboys. Both scenes still rivet the attention. The scene that became a major influence on dinosaur cinema, however, goes by almost unnoticed. It’s so real and so right that it feels almost like an after-thought (though it isn’t). I refer to the scene in which a fleeing Ornithomimus runs across frame, only to be caught and killed in the jaws of Gwangi. 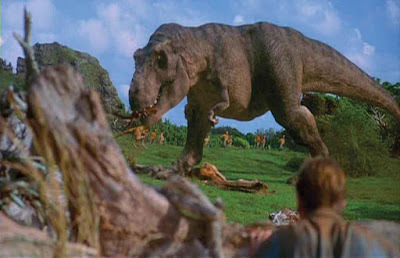 This moment is repeated, almost as a film quote, in a Jurassic Park (1993) scene featuring a T-Rex and a Gallimimus. 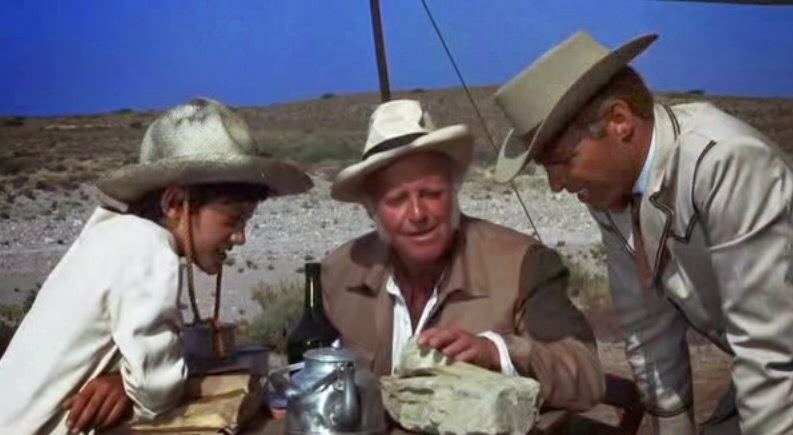 Unlike Lope’s father in The Valley of Gwangi, I don’t believe it is “not good to dig up the past.” There is still value in The Valley of Gwangi, for certain, and yet I don’t now consider it a classic in the same league as many other Harryhausen films. "And when I was young, The Valley of Gwangi was on TV all the time. Or at least it seemed that way." In Charlotte NC it was. Like Horror Express and Them, it was on at least once a month. Super film, with some of Uncle Ray's finest effects. I always remember this film fondly. After seeing this on the 70's CBS late-night movie on Friday, I was mesmerized. I thought it was the most awesome dino film ever! Magazines like Starlog helped me appreciate the effects genius of Ray Harryhausen. I would eagerly look forward to every one of Ray's films on tv (only saw "Clash of the Titans" on the big screen). ILM effects artists often describe Harryhausen's work as being a big influence. Your example of Gwangi catching the smaller dino is a great example.